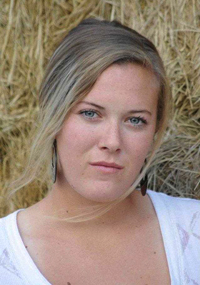 The final year of her high school rodeo career has turned out pretty well for Wood River High School graduating senior Haillie Taylor, who will attend Colorado Mesa University in Grand Junction this fall. She qualified in five events for the Idaho State High School rodeo finals June 11-15 in Pocatello. In girls’ cow cutting, she achieved her goal of qualifying for the Cinch National High School Rodeo Finals July 15-21 at Rock Springs, Wyo. At state, Taylor fell just short of qualifying for nationals in breakaway roping. Although she came out strong in breakaway, leading the event going into the short go, Taylor ended up fifth by a half point—with only the top four qualifiers making it to nationals. But she did qualify to go to Silver State International Rodeo. Taylor plans to compete in breakaway roping, barrel racing and pole bending during the Silver States July 2-7 at Winnemucca, Nev.
To raise money for the upcoming rodeos, Taylor will do fundraisers (selling bracelets) and will solicit sponsorships. At Winnemuca, she will ride horse Picabo in pole bending. Haillie has competed with Picabo since she was in the fifth grade—a great eight years of rodeo in all. She plans to retire her after this summer of rodeo. She is going to breakaway rope off of her roan gelding Roanie, a mount since the seventh grade. Taylor plans on taking him to college in the fall. Haillie has picked up a new horse named Cowgirl that she competed on during the spring 2012 District 5 rodeo season and at the recent Idaho State competition. She will ride Cowgirl in barrels at Silver State. Taylor’s top event in 2012 has been cow cutting, one that gave her a share of the District 5 season title and her nationals berth. Kitty is Haillie’s cutting horse that she is going to compete on at nationals. She first got Kitty when she was four. Their goal was making it to high school nationals—a feat they achieved June 11 in placing fourth at state with 43 grand total points behind repeat state champ Sadee Smith of the Idaho Digital Learning Academy in Star (65 points). In breakaway roping at state, Taylor’s 30 grand total points put her in fifth place, just a half-point behind fourth-place Karlee Worthen of Rigby (30.5). Taylor had a couple of 3.11-second and 3.01-second rides. The breakaway winner was Kuna senior Bailey Bartlome, who also won goat tying. Girls’ all-around winner at state for a second straight year was South Fremont sophomore Makayla Boots with 140 points—47.5 in poles, 49 in goats and 43.5 in team roping. In fifth place overall was Darby Fox of Glenns Ferry (82), the barrel racing winner. Taylor placed eighth overall of 45 cowgirls with 73 grand total points. The boys’ all-around winner for the third straight year was Madison High School senior Garrett Smith (239.5 points). Pocatello High School cowgirl Macie Bullock was crowned 2012 Idaho rodeo queen June 16.